Welcome to Synths.co, dedicated home of synthesizers and associated music production gear. Welcome to Synths.co, dedicated home of synthesizers, keyboards, midi-controllers, sequencers, samplers, DAW's, soft-synths and associated music production gear. At Synths.co we love all things synth and anything related to the subject with a passion, everything that enhances musical creativity for the modern musician, whether it regards classic instruments of the past or instruments of the 21st century, we know that many people find all of this useful for creating both new music and in re-creating retro style music, particularly if you are new to the subject. It is a vast area of interest for wide spectrum of people, from professionals, home studio enthusiasts and students studying music technology, so we hope you find the site both informative and helpful. Synths.co is dedicated to all things related to synthesizers, hardware synths, software synths DAW's, drum machines, sound modules, hardware sequencers, controller keyboards and much more. 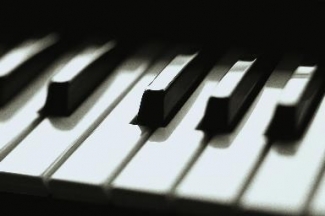 We cover all aspects of music creation using electronic musical instruments. If you, like us, love to discover new synth facts and information and enjoy reading about electronic music related subjects then you're in the right place ! 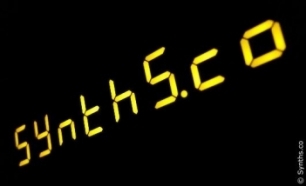 Synths.co is an online resource which seeks to fill in some of the gaps for the synth owner and user. Access built this instrument from the ground up, black in colour, the user interface featured powerful Motorolla processors delivering 32 note polyphony and 98 simultaneous effects, including sixteen 3 band EQs, six surround cable outputs, 1024 patches, sixteen midi syncable arpeggiators, a 9x6 modulation matrix and ultra fast envelopes tracking the full 24 bit range (144dB) with a 22 microsecond rise time, with a 61 note keyboard with aftertouch. An analog modelling synth which followed on from the original release of the Virus C series of instruments, a powerful sound engine was incorporated into the Virus Indigo Version 2 keyboard, it offered upgraded 32 note polyphony, 1024 programs (256 user/768 in ROM) with 98 simultaneous DSP effects. The six 24 bit outputs provided surround sound capabilities, and the synth had 37 full sized keys with aftertouch, aluminium side panels, pitch/mod wheels, 6 pole filters and a universally acclaimed rich sounding 4 oscillator analogue modelling algorithms and 16 arpeggiators. The Andromeda synth used completely analogue circuitry to provide its 16 note polyphony, dual oscillator sound generation, ribbon controller, sequencer, digital control, midi, LCD, digital effects with 256 presets, card storage and audio in. The Alesis Fusion 6HD Workstation features four synthesizer elements, an eight-channel hard disk recorder, built-in sampler, fully assignable effects processor and expandable RAM, it's main processing power comes from a Coldfire processor in conjunction with seven high-performance DSP's (Digital Signal Processors). The synth workstation has integrated 8-channel 24-bit recording facilities and released in a 61 note, semi-weighted 6HD version, and also a full sized 88 note fully-weighted 8HD, aimed primarily at the professional project studio or for live performance. The Nord Lead 2X was redesigned from its original spec to improve the internal hardware structure, it featured improved memory and preset banks of sounds. With a 4 octave keyboard and 16 note polyphony, and compatible with older synth patches from previous versions it had a total of 693 factory presets and 298 user locations. A 4 octave advanced subtractive performance synth with aftertouch, 24 note polyphony and 4 part multi-timbrality. 26 of the synths parameter could be morphed with additional polyphonic legato and glide, with the ability to stack a total of 18 notes at a time if required. The Clavia Nord Modular G2 was a lead style synth with a 3 octave keyboad, mic input and 24 bit 96KHz A/D and D/A converters, 5 oscillator virtual analogue modelling with 5 LFO's, 8 morph groups per individual patch, a step sequencer and pitch-bend stick. The Prophet 08 is an eight-voice synthesizer with a 100% analog signal path. It includes features such as velocity sensitivity and aftertouch coupled with the addition of an arpeggiator, gated step sequencer and the ability to four-on-four split and layer sounds, with separate outputs for each layer. The modulation possibilities are now much more advanced than that of the earlier Sequential Prophet days of the 70's and 80's, so it is now a much more evolved instrument and has superior sonic capabilities in the analogue sense. In addition to the standard version of the Prophet 08, Dave Smith Instruments released a 'Special Edition' model whose features included red lighted pitch and modulation wheels, two analog oscillators per voice, classic Curtis analog low-pass filters, extensive modulation and routing capabilities, coupled with exterior cosmetics which included leopardwood end cheek panels, and a special commemorative overlay signed by Dave Smith. It was bundled with editor librarian software and the " Dave Smith: Synthesizer Pioneer" DVD. Although it was considered to be pricey on first release, the Hartmann Neuron featured a radical concept in synthesis which utilised a form of CPU adaptive neural net processing, a 5 octave keyboard, a 256MB sample RAM, 64 floating point DSP and a 20GB hard drive. 5 octave keyboard with Hyper Integrated synthesis which offered a 32MB ROM for 425 multi-samples, 423 drum sounds and full GM2 bank with 640 user presets, 768 multis and 64 drumkits, up to 5 stereo insert effects, 2 global effects, EQ with 102 FX types to choose from, 16 track 200,000 note sequencer to a maximum of 200 songs, SMF compatible floppy drive and key triggering of patterns, 8 knobs for realtime control, 4 line-outs, pitch/mod joystick. We've recently carried out a repair on a Korg Triton Classic regarding a lack of audio output from the Main L/R jack sockets, detailed below are some pictures demonstrating how we did this, the problem with this particular unit was primarily caused by a loosening of the jack socket on the audio output PCB to the rear of the synth resulting from a combination of continual plugging-in and un-plugging of jack plugs, more than likely caused by rough handling and regular gigging of the instrument by a previous owner at some point. 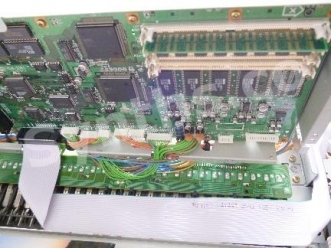 This repair also necessitated removal of the KLM-2089 sample+hold pcb located on the MOSS/EXB PCM central metal internal framework (top-left in the photo above) in order to gain access to the audio pcb KLM-2084. 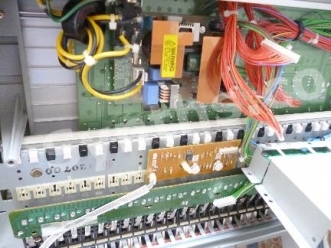 This required careful and considered dismantling of the Triton in order to gain access to the circuit board in question and remove it in order to affect the repair. On removal of the Audio Output PCB it was discovered that the Left Main Out socket was, for want of a better term 'wiggly' on the circuit board when compared with the other jack sockets, and on closer inspection it was clearly apparent that dry solder joints on the underside were the culprits and to blame for the total lack of audio output in this particular case. It was a straight forward re-soldering job to make the repair, followed by a basic electrical continuity test, which was carried out by plugging a spare loose jack plug (with no audio lead attached) in to the Main Left Out socket and testing from the PCB to the jack plug solder terminals to confirm that the repair was good and shouldn't cause future problems. It's very unhelpful and particularly frustrating if the synth has no output when you try to gig with it or need to use it under time constraints for a project, so having an instrument in good operation restores your confidence in it if you need to take it anywhere and use it. 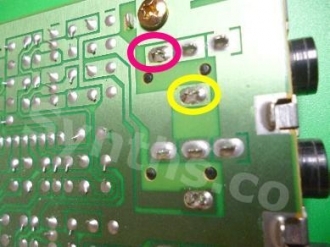 Pictured below is the Main Left/Mono Audio output socket, the pink circle indicating a fixing solder joint (to prevent the socket from wandering in the diagonal sense), and the yellow circle indicating the faulty solder joint which needed re-making to re-establish correct output and solve the problem. 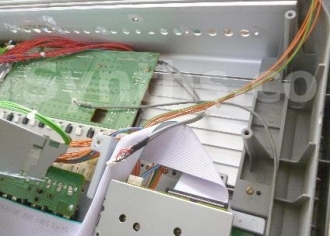 Great care should be taken when carrying out this sort of repair and only if you feel you are competent and confident enough to do so, otherwise you can potentially do more harm than good, in which case you should get the instrument repaired by professionals. You should never rush this sort of task, take your time and be thorough as you go, especially when re-assembling the keyboard so that you don't miss anything. It's also worth noting that this type of dismantling should not be carried out on any synth that is still within its Warranty period as this, with almost all equipment, invalidates the manufacturer Warranty. If the instrument is still within its Warranty period it is strongly advised that you consult your dealer or the manufacturer first before even considering taking the instrument apart. Our Triton is well out of its warranty period (by approx. 10 years!). 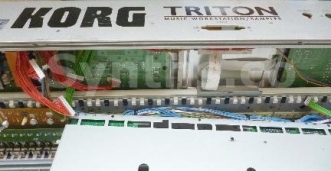 You can discover plenty more juicy info on the Korg Triton series and many other fixes for problems by visiting karma-lab forum which features an extensive Triton series section. Available in 61, 76 and 88 key versions, the Triton Extreme was a sampling workstation synth with 160 MB ROM, 1344 presets, 1280 multis, 50 drumkits, 256 GM2 patches, 120 note polyphonic, 16MB (expandable to 96MB) sample RAM, USB, CDRW drive, digital I/O, CompactFlash card backup, wave file import, stereo valve preamp onboard, effects, modulation matrix and sequencer. Was a 61 note workstation synth consisting of a condensed version of the Triton flagship synth with Hyper Integrated synthesis, 16 track sequencer, 512 patches, 384 multi-samples, SCSI and SmartMedia card, the Triton LE had an optional sampling upgrade. 5 octave version of the flagship Triton Studio workstation synth. The Triton Studio had 48MB onboard sound library, 16MB user sampling RAM (expandable) and 60 note polyphony for the samples plus another 60 note polyphony for the piano bank and expansion cards, many effects, interactive touchscreen and sequencer. Was an 88 key hammer-action sampling workstation synth with 48MB of internal sounds, 16MB of sample RAM (expandable to 96MB), 60 note polyphony for the samples plus another 60 note polyphony for the piano bank and expansion cards, many different effects, large blue interactive touchscreen, onboard CDRW drive, 16 track sequencer, digital output, Korg Hyper Integrated synthesis, joystick and ribbon controller. A 3 octave virtual analogue synth with 8 band vocoder, gooseneck microphone, 2 oscillators, 4 note polyphony, over 70 waveforms, ring modulator, sync modulator, two ADSR envelopes, 4-pole resonant filters, virtual patch matrix, arpeggiator, 3 mod effects, 3 delay effects and 2 band EQ, 128 presets and Audio In socket. 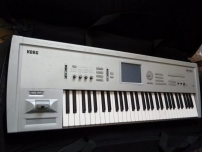 The Korg MS2000B was an upgrade version of the original MS2000 virtual Modelling synth, with a black finish, 44 keys, 4 note polyphony, 2 oscillators, sequencer, vocoder (with mic), full complement of effects, arpeggiator and a ring modulator. 5 octave keyboard synth with a GM compatible sound set, 64 note polyphonic, 16 part multi-timbral, pitch and modulation wheels, 2 effects DSP blocks with 47 algorithms and a combi layer stack mode. Was also available in a half-sized rack version, the X5DR. The VA1 was an analogue modelling synth based around a 61 key, 16 note polyphonic engine, the oscillators being Power Shaped (PSO) which allowed morphing between waveforms, with 7 sound sources per voice, 4 effects bus, 4 arpeggiators, mic in and a 48 band vocoder. 76 note fully weighted synth with 8 balanced outputs, 32 track sequncer and KDFX dynamic effects. Version 3 of the Limited Edition Voyager Electric Blue updated both the hardware and MIDI firmware, expanded the library to 896 new presets categorized into 7 banks. Cosmetical the synth styling was altered to a wooden cabinet finished in sleek black with dozens of blue LED's and blue graphics for the control panel layout. The pitch and modulation wheels were also backlit with blue light illumination plastic. The Moog Voyager V3 offered several subtle revisions to the original Voyager editions. The presets were expanded to 7 banks from the earlier 128 preset versions up to a maximum of 896 in total, many authentic Moog patches having been re-created by third-party programmers. Further refinements included switchable 14-bit or 7-bit MIDI data from the modulation wheel, to make the synth more compatible with early 80's MIDI devices. Presets could also be scrolled through via one knob. The keyboard itself had 44 velocity sensitive keys with aftertouch, pressure pad, pitch/mod wheels, cherry coloured wooden cabinet, external audio outpus and a five channel mixer. Internal architecture featured 3 oscillators (as with the original 70's Model D variants), 2 filter synthesis with 2 envelope generators, VCA and selectable LFO waveforms reminiscent of Bob Moog's classic. The Model D Minimoog was born from a concept by synth pioneer Dr. Robert A.Moog to create a warm sounding, but punchy, versatile, affordable and above all portable analogue synth. The Model D's internal circuitry was based around discrete electronic components (as opposed to Moog's later products like the MemoryMoog which contained the legendary Curtis SEM filter chips) to give the Minimoog those full, rich and harmonically pleasing tones. Instantly recognizable, this 3 VCO beast provided something that had previously been missing from many a pop song before it arrived, loved by live players and a great favourite of the Prog-Rock brigade, and featuring contour filtering control and drawing-room wooden end-cheeks it quickly became a classic. The hardware has been updated in recent years in the form of instruments like the Minimoog Voyager, Voyager XL and Little Phatty, all with greatly enhanced functionality and capabilities far beyond the scope of the original Model D machine. Many a clone has been produced using the Model D formula, with the advent of analogue modelling techniques within the hardware of synths of the 1990's and computer processing power increases at the turn of the millenium, software emulations are now the main staple in most home and professional studios to generate the Mini sound, Arturia, Minimoog VA (VSTi) to name but a few of many, can all be driven from a controller keyboard attached to a personal computer, and/or run as Apps from just about any mobile tablet style device in many cases. Almost every synth since the mid-1970's, of all budget ranges, from the most expensive to the least expensive have included a close recreation of the Minimoog Model D's Brass, String and Bass sounds somewhere in their factory preset wave memories. A clear indication of just exactly how iconic and inspirational this instrument was and still is today. The hand-built Little Phatty analogue synthesizer was designed with portablility and affordablilty in-mind. Both expressive and intuitive playability combined with a 100% analog signal path, 100 user editable presets and a 37-note keyboard with a +/- 2 octave Transposition. A very cost-effective way of recreating that classic Moog sound without harming the bank balance too much. Highly desirable on the second-hand market, these instruments can hold their price and are readily sought after, particularly by live-stage musicians who relish their sound as a 'proper' synth in the classic sense and tweakable nature and user-friendly analogue interface. Moog launched the Little Phatty synth in 2006 as a tribute to founder Bob Moog, the next production model of the Little Phatty consisted of the same overall design but with a much lower retail cost to the musician and with improved software and a unique auto-calibration feature. With a 3 octave keyboard, 100% analogue circuitry for all the signal path and real analogue controls, two ultra stable voltage controlled oscillators and one voltage controlled filter. The instrument could play as a self-contained unit or be driven via a MIDI interface (like a Kenton for instance) or by using an old-fashioned CV Gate (control Voltage) input to make it compatible with older machines. With 100 user presets, backlit pitch-bend and modulation wheels with asymmetric mode, charcoal rubberized side panels rather than the traditional wooden end cheeks of the previous Little Phatty. 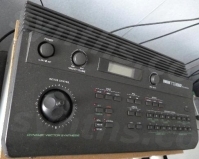 The Novation K-Station was a 25 note keyboard synth version of the A-Station with analogue modelling of vintage Moog, Oberheim and Roland synths, 8 note polyphonic, 3 oscillators, 2 LFO's, 4 pole filtering, 12 band vocoder, sync arpeggiator, 400 presets and effects DSP. 61 note workstation synth with 64MB preset wave ROM, 32MB RAM for sampling, 16MB internal flash RAM, USB and a SmartMedia drive. 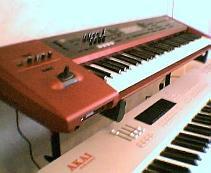 A 61 note keyboard workstation offering a 128 note polyphonic sound engine and a standard 128MB internal wave ROM of factory presets, including a split-key concert grand piano multisample, 4 expansion slots to accomodate Roland's SRX boards which allow an extra 512MB of user sounds to be added. The sampler itself has 32MB of factory fitted RAM whic hcan be expanded to 544MB, providing a total of 1184MB of onboard sounds. With a full colour LCD screen, 16 trigger pad drumbank, infra-red D-Beam controller, V-Link video interface for Roland and Edirol equipment, light-up buttons and pitch/mod joystick. With a large 76 note keyboard, the Fantom X7 provides 3 internal COSM effects busses, plus dedicated reverb, chorus and mastering processor, a USB interface will import or export WAV/AIFF files, a powerful 400,000 note sequencer, skip-back sampling which to capture the last thing musically played at the touch of a button, 24-bit S/PDIF digital I/O, PC card slot, 4 mono and 2 stereo outputs and sample data compatibility with Roland and Akai formats. 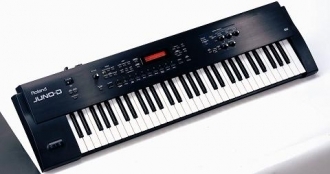 The flagship of the Fantom series of synthesizer workstations featured an 88-note weighted-action keyboard with multicolour LED buttons and a huge colour LCD display, built-in 16 pad rubber drumbank, 512MB sampling, 1Gb of internal sounds (when fully expanded). The RS-50 was basically an improved version of the RS-5 synth with 61 standard sized keys and a new sound ROM featuring hundreds of new presets, infra-red D-Beam controller, arpeggiator and many pre-programmed drum patterns. Was a 61 note synthwith USB interface, floppy drive, D-Beam infra-red controller, loop sequencer with real and step-time record and edit and the addition of a phrase/arpeggio player, with full GM and GM2 compatibility. The Juno-D (the original production Juno-D) features a 61-key standard sized velocity sensitive keyboard with parameter a controllable aftertouch facility, allowing aditional sound manipulation post keypress. It falls under the category of S+S synthesizers where you can work from factory programmed sounds to obtain new custom sounds for your music. The instrument contains a reasonably extensive sound architecture consisting of a sound generator, keyboard section and control assignment section, which in combination provide the musician with flexibility of sound control. The sound of the Juno-D utilises the familiar Roland Tone/Patch/Part structure which are fully assignable to upper and lower splits/layers across the span of the keyboard. Patches (sounds) are categorized in an extremeley immediate and user friendly way, where 10 numeric front panel buttons clearly denote instrument groupings, Piano, Strings, Synth, Guitar...etc. In this way the Juno-D is very suitable for a hardware synth beginner. Also featured are dedicated front panel 'quick chord memory' and 'phrase/arpeggio' buttons where you can pre-determine chord structures while playing a single key and use the preset built-in arppegios to develop and assemble tracks at speed or jam along to them as backings while you play or practice performed parts of your own music, quite an inspiring way to write new music using prvided musical ideas. A set of front panel transposition buttons allow quick movement between octaves to cover playing in either the upper or lower registers, particularly useful when accompanying other instruments or singers in a band or orchestra for instance. The Juno-D also contains are reasonably extensive (but not exhaustive) programming section where users can delve into the Tones themselves to construct custom ADSR sounds from scratch, alter things like filter cutoff or resonance and assign them to the various hand controllers such as the D-Beam, modulation lever and foot-pedal, or operate them from another instrument via midi. An assignable D-Beam ( a very common feature now on many modern Roland synths and samplers) gives provision for control of part of the sound elements of a patch to make expressive sounds whilst performing, for insatnce you can assign the D-Beam to control modulation instead of (or as well as) the modulation lever. That is just one example, there are many others. The D-Beam can also effectively filter 'duck' a sound as you would hear in a dance track for example, or can be switched to a preset called solo-synth for making theremin type squeals to play hand manipulated solos typical of a sci-fi movie of the 50's. A great deal of fun and sonically wacky for the listener too. 5 octave analogue modelling synthesizer with 32 note polyphony, 16 discrete 4 pole filters, 5 oscillators, 3 LFO's, 20 drum maps, S/PDIF out, 2 CV inputs, 32 step sequencer, arpeggiator with RAM card slot. The original, and classic 61-key DX7 was released in 1983, it had a touch-sensitive keyboard, responsive to velocity with afertouch, 6 FM operators, 32 user programmable memories and 32 factory presets, along with basic midi functionality, which was a major technological leap for the time. Removable ROM and RAM cartridges could both be used to store up to 64 sounds at a time, another first for mainstream synthesizers, a plethora of independent companies began to produce custom made ROM cartridges with an enormous variety of sound sets for the consumer, another first for the digital synth era. The DX7 gradually became legendary because of it's use on hit pop records and countless TV appearances with music artists and bands. This fuelled huge numbers of sales, being affordable for the time, made the DX7 synonimous amongst musicians. The instrument also featured LFO, glissando, portamento, pitch bend and modulation wheels, a 2 line alpha-numeric LCD display, 16 flush-panel membrane buttons and a Breath Controller input (for use primarily with the WX wind synth series of instruments which became popular with live performers in the mid-80's. The quality of the DX7's presets (for the time) were of such high quality many users tended to just use the presets and ROM's as opposed to the more complicated approach of programming sounds in FM from scratch, which by comparison was far more difficult, time-consuming, and less user-friendly for the average player. 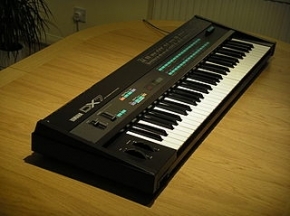 The DX7 revolutionised many things, being the first purely 'digital' synth to hit the mainstream market, portablility of a synth coupled with being able to reproduce sounds with fairly good accuracy, from electric bass guitar, to mimicking a Fender-Rhodes piano, along with crisp FM tones such as bells, whistles or percussive sounds, and good clarity bright lead-synth sounds; and all of this in one affordable package that was polyphonic too, and, unlike the mon-synths of the mid-70's the DX7 series could retain sounds in memory or on the RAM cartridges for later recall and use later which was more or less unheard of up until the release of the DX7. The DX7 is still a fairly sort-after and highly collectable synth, although in recent years the trend for soft-synth immitations has overtaken people's gear-lust for the original instrument (as it has for many other synths) simply owing to the lack of space that software takes up compared with synth hardware. 88 note weighted action AWM (Advanced Wave Memory) workstation synth, it's internal architecture facilitating 2 plug-in expansion cards, a capable instrument providing piano, virtual modelling, analogue modelling, DX, XG, or vocal harmonizer cards. 61 key, velocity sensitive standard sized keyboard. The SY-35 uses a combination of AWM (Advanced Wave Memory) and FM (Frequency Modulation) as a tone generation system in order to create variation using a Vector Controller which the player can manipulate whilst playing. The voice architecture can be altered between 2-element or 4-element operation, sounds can be all FM or all AWM or any combination of the 2 types, to make combined single multi-layer voices. This is particularly useful when using the SY-35 to come up with sounds which vary over time, or whose effect parameters become more apparent later within the sound itself. The Vector Control itself can be set for either element level or detuning parameters to cross-manipulate or blend the four chosen ABCD core sound structure into one overall sound wave, the sound can then be varied in realtime between plosive or percussive to a more ambient or architectural type sounds. The movements of the vector controller can also easily be recorded via midi parameter using an external sequencer connected to the midi in/out ports for later playback whilst performing. Features 128 preset voices and 64 user voice memory locations, with the additional option to extend the library of sounds available to an unlimited amount on memory cards (MCD32/64) which can be inserted into the back of the instrument (Preset PCM or RAM cards (where you can save the sounds you've created yourself on the instrument) are available, although these are becoming increasingly harder to find now as the instrument ages), or alternatively, and far more likely is the the option to load sounds via midi, this can be achieved by using a midi software editor/librarian from a computer, many of which are now freely downloadable from the internet. 16 onboard digital effects including reverb, delay and distortion, many of which can be assigned as combined pairs to alter the final output sound, eg. Reverb/Delay or Distortion/Chorus. 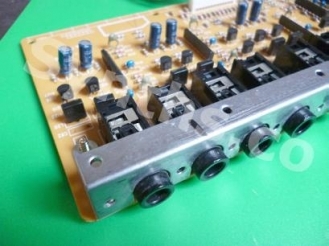 Dual Stereo Outputs on 1/4 inch jacks, headphone socket (1/4 inch). Project 5 v2 was a powerful recording, looping, sequencing and arranging DAW, with dynamic creation tools and synth hosting facilities, as well as Groove sequencer, unlimited audio and MIDI tracks, intuitive pattern-based sequencing, simple user interface, 10 studio quality effects including reverb and EQ and integrated audio and MIDI recording for live use. Learn more about Kinetic 2 in our dedicated retrospective of this particular DAW. Cubase 4 for was developed from the out-set with professional music production in mind, it came with a brand new VST3 plug-in set and four new software instruments. It featured the SoundFrame combination of Track Presets, Instrument Tracks, and MediaBay database to assist the user with organising sounds from each instrument, whether they be hardware or software driven. The 'Studio' version of Cubase 4 differed from the basic release for composers and producers by the addition of integrated instruments providing more than 600 sounds on tap and score notation capability. As with the basic version it included the SoundFrame Universal Sound Manager. The Steinberg Sequel music production software concept was derived from a growing need to cater for the first-time computer music enthusiast, designed to be affordable, but possesing great quality implementation of intuitive tools. Recording, editing, mixing and performing were simple with loops (over 5000), instruments (600) and effects all provided straight out of the box, making it very user-friendly for those with no prior experience of working with a DAW. The TG33 uses a combination of AWM (Advanced Wave Memory) and FM (Frequency Modulation) as a tone generation system in order to create variation using a Vector Controller which the player can manipulate whilst playing. The voice architecture can be altered between 2-element or 4-element operation, sounds can be all FM or all AWM or any combination of the 2 types, to make combined single multi-layer voices. This is particularly useful when using the TG33 to come up with sounds which vary over time, or whose effect parameters become more apparent later within the sound itself. 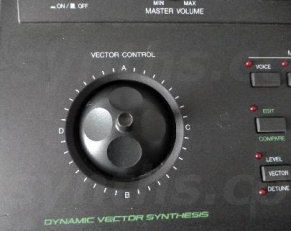 The movements of the vector controller can also easily be recorded via midi parameter using an external sequencer connected to the midi in/out ports for later playback whilst performing, this can be particularly effective for making backing sounds which swirl or contain sweeping layers beneath other sounds. 16 (2x8) memory locations for multi-play setups, e.g. piano/strings/bass/drums on individual tracks for sequenceing, keyboard split zones or layering up of sounds. 256 preset FM waveforms are available to the user and 128 preset AWM waveforms allow a decent range of sonic capablilities and versatility to the instrument. 16 onboard digital effects including reverb, delay and distortion, many of which can be assigned as combined pairs to alter the final output sound, e.g. Reverb/Delay or Distortion/Chorus. Can be used as a desktop device or is rackmountable. The SP-606 is a sampling workstation designed primarily for the dance/hiphop/DJ market, but can be used very creatively in general for a vast number of music genres. The core of the instrument is constructed around a top-face panel consisting of 16 velocity-sensitive pads which can be played by the musician to control sample loops and grooves in realtime, played live or for pre-programming and constructing tracks from scratch while looping others to run in the background. 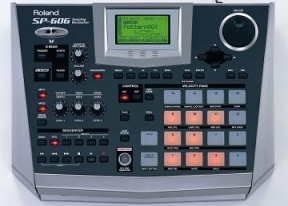 The SP-606 is a legacy sampler derived from the era of the Roland Groove-Station/Loop-Station category of devices and features pad-banks where the musician can select sets of samples to pre-load or create themselves and then play them together in a large variety of ways to form the basis of songs or backing tracks to perform over the top of them. Basically any sound which is audible can become a sample for the SP-606 to manipulate, a vocal, a drum or percussion hit, a guitar lick, a synth pad, or even pots and pans from your kitchen (using a mic of course to capture the initial sound). 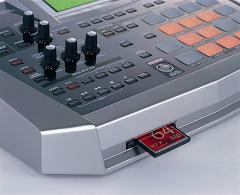 Many musicians have already made thousands of samples which can be loaded directly into the SP-606 as .wav sounds from either a computer using the usb port on the rear of the unit, or by using compact flash cards. If you don't wish or have the time to make your own samples. The sampler contains 8 banks of factory programmed samples to use straight out of the box, these have already been structured into groups in order to create patterns and finally songs. 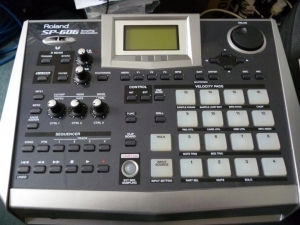 You can use the SP-606 is to make enitre songs, as the instrument also allows a musician to add 45 different effects to the music created on it, before exporting or recording from with software or hardware based recording mediums. 4 individual tracks are available to record sample phrases, so that you can construct parts in various ways and ultimately form them into a full song by piecing them together. Discover more about the SP606's software equivalent Kinetic 2 . You can utilize flat sheets of things like plasterboard (Dry-wall in the U.S) to create temporary false walls, old kitchen worktops that people are getting rid of when they're replacing kitchens, ask around, someone's probably ditching something, kitchen units, old wardrobes or cupboards (old wood effect ones). Basically anything you can fix acoustic foam to, if you know of any local builders, carpenters or joiner's etc, ask them if they've got any sheets of 8 x 4, 10 x 6 chipboard or MDF (Medium Density Fibreboard) or something similar knocking about the place or whilst renovating a property/real estate, that you can have for nothing or a couple of pounds/dollars. Local Freecycle or Recycling websites are a great way to find raw materials that others no longer require, if you get really stuck you can always try your luck at a local builder's merchants or even sawmills who may have some off-cuts and odd pieces that they are more than happy to clear out of their way, so you should be able find something suitable for virtually next to nothing, especially if you're on a tight budget. You can almost make complete false walls with stuff if you have to (but obviously make them removable too! ), particularly if dwelling in rented accomodation, you can get it right up against the walls which are causing the biggest problem and are the most disturbing to others, fix the thickest acoustic foam you can afford (the thicker the better, obviously) to it with some spray-on conact adhesive from diy stores etc., it'll help damp the overspill noise out quite significantly to anyone else who can hear it. If you think the sound is transmitting through the doors (internal or external) or even the windows, get some Duvets, old ones or new ones (often the bedding and homeware shops/stores are selling them off cheaper as we approach the spring/summer to clear out old stock, the thicker the better because they're wadded inside, 13.5 tog is the thickest. What you can do is hang them over the tops of the doors, or even better grab a couple of coat hangers (sturdy ones though) and tie one corner at the top to one coat hanger, and the other top corner to the other coat hanger, next hang the whole thing from the doorframe at the top if you can get it to stay there somehow, so that it hangs down completely over the door from top to bottom preferably, inside the room that your gear's in. Some builder's merchants still stock Rockwool which is the original method for soundproofing that bands used to use. You might find they've got some off-cuts, ask them, ends of rolls that might do the job that you can purchase cheaply. If you can't get Rockwool or it's too expensive, try getting a roll of thick loft insulation if it's cheaper, that'll help too. A lot of musicians use spray-on instant adhesive (B&Q, Jewsons, Walmart, 99c stores or £1 shops or any independent hardware store) for quick fixing sound-proofing to the actual panels, or you could use PVA glue, No-Nails, Mastic, anything really as long as you can apply enough to stick it on firmly. If the speaker boom (the drum and bass bottom end sound) is transmitting through the floor try putting the speakers on some thick foam or similar to take the punch out of the sound and uncouple them acoustically from the furniture they're sat on, if you can feel it vibrating through your feet it's going to be heard and felt in the rooms below because it's resonating through the floor joists or internal partition walls below. If you can, turn the loudspeakers to face in the opposite direction to the neighbour who's got the problem, and if the speakers are ported at the back (with bass, or sub-bass holes) put some thick acoustic foam a few inches directly behind them, that'll damp down the boom effect from blasting straight onto the wall. Move the speakers as far as poss from that neighbour too, but do try not to compromise your listening position if you're composing/mixing your music as this can greatly affect your ear perception and consequently the mix of the track. Chances are, if you've received a letter of complaint about noise pollution it's come from the local council or other local authority's noise abatement department, if that's the case they will have been outside at some point with a sound level meter and if the noise is above the legal limit of decibels for a residential area they can legally enforce complete removal (confiscation) of the audio equipment (all of your gear) if deemed necessary, so to keep them sweet you'll need to do as much as you can to comply unfortunately. If they're any good they should be suggesting ways that you can comply and still do what you want to. Generally though they're on the side of the person who's complained, especially if they work funny hours or have small children, so you'll be required to everything you can in order to comply. Venues in England and Wales with a capacity of under 200 people will no longer need a licence for live music. The change in law is part of a government move to free businesses from red tape, which ministers say will give them more freedom to grow UK music, estimates that the Live Music Act could enable 13,000 more venues to start holding live music events. Live unamplified music can also now be played in any location under the act.